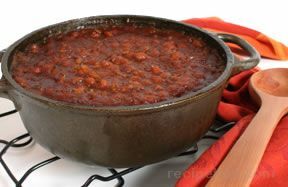 The savory aroma of these traditional baked beans, prepared with molasses, brown sugar, and bits of bacon, will whet the appetite—and the flavor will cause them to disappear. Coat inside of casserole dish with non stick cooking spray. Preheat oven to 325º F.
In a large bowl, combine all ingredients. Pour bean mixture into prepared casserole. Cover and bake 1 hour and 30 minutes. Container: 2-1/2 to 3 quart casserole.